NBC's wave of midseason programming changes, made at the height of Hurricane Sandy's East Coast surge, is highly puzzling on at least one front. The Peacock has the new season's top freshman hit among advertiser-prized 18-to-49-year-olds. Only six episodes have aired to date. And yet Revolution will be going on a very extended hiatus after it "concludes its current fall broadcast dates in November,"
New episodes of Revolution so far are scheduled on only Nov. 5th and 12th. Another one likely will air on Nov. 19th, the last Monday of the four-week November "sweeps" ratings period, which ends early this year on Nov. 21st. A post-Thanksgiving, Nov. 26th episode also is a possibility. Still, that would only bring the season total of new episodes to 10 at the most. And Revolution will then disappear all the way until March 25th, when it's slated to return on Monday nights in tandem with a new season of The Voice. 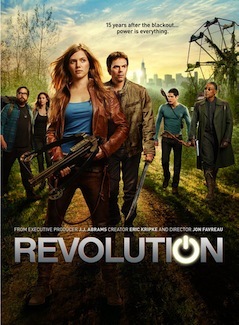 NBC earlier announced a full-season pickup of Revolution. Traditionally that's a 22-episode order for series launched in the fall. So if that's the case, how will the network cram a minimum of 12 new weekly hours of Revolution between March 25th and the end of the 2012-13 TV season in late May? Will some new episodes actually bleed into June? That would be highly unusual. Might NBC offer double doses on some nights? Or does the network's full-season order in fact come up a few episodes short of the usual 22? Inquiries have been made to NBC spokespeople, with no response as of yet. But whatever the case, the whole idea of taking a hot show off the air for such a lengthy hiatus runs the considerable danger of killing its momentum, let alone audience interest. NBC tried much the same strategy with Heroes, although the down times were of far less duration than the one planned for Revolution. Audiences quickly lost interest anyway, and the show died perhaps a season or two earlier than it should have. ABC likewise tried to reboot both V and FlashForward after long absences from its schedule. This didn't work at all. Serial dramas continue to present a unique challenge to networks. Unlike self-contained "police procedurals," they're not conducive to a patchwork quilt of new episodes and repeats. Viewers want to see the likes of Revolution and ABC's new Last Resort in uninterrupted strings of fresh hours. Otherwise you break the rhythm and confuse fans of these shows. But if you take them off the air for too long, you break the habit. Fox made 24 work by airing all of its yearly episodes in a continuous string from January to May. ABC downsized its orders of Lost to 16 episodes per season -- and then aired them in pretty much unbroken order during the show's final three years. Revolution instead is facing a four-month power outage in its first season after only a relative handful of new episodes have aired. This just doesn't compute. And if NBC manages to turn a hot property into a cold front, it will have only itself to finger. ***Starting on Jan. 7th, Mondays occupied by The Voice and Revolution will give way to two-hour dollops of The Biggest Loser followed by a new "dark family murder mystery" called Deception (previously titled Infamous). Stars include Meagan Good (Think Like A Man) and veteran Victor Garber. ***The second season of Smash launches on Tuesday, Feb. 5th with a two-hour episode featuring Jennifer Hudson. It will then take Parenthood's 9 p.m. (all times central) slot on the following Tuesday. A new season of Betty White's Off Their Rockers will fire up at 7 p.m. Tuesdays, starting Jan. 8th. ***On Thursday, Jan. 10th, the new comedy 1600 Penn gets the 8:30 p.m. slot. Bill Pullman and Jenna Elfman star as the President and First Lady. Community also returns on this night, but not until February 7th in a 7 p.m. cranny. ***An All-Star edition of Donald Trump's The Celebrity Apprentice debuts on Sunday, March 3rd. And a new reality hour, Eva Longoria's Ready For Love, is due on Sunday, March 31st. Longoria is the executive producer, with hosts Bill Rancic and Giuliana DePandi-Rancic supposedly guiding contestants on "romantic journeys." Giants-Tigers World Series ends up being least-watched ever -- San Francisco's four-game sweep of Detroit averaged 12.7 million viewers nationally, with Game 4 drawing the biggest crowd (15.5 million) and Game 3 the smallest (10.5 million). No World Series has ever gone lower. The previous record-holder, Philadelphia's five-game defeat of Tampa Bay, averaged 13.6 million viewers in fall 2008. Last year's seven-gamer, in which the St. Louis Cardinals beat the Texas Rangers, had an overall average of 16.6 million viewers.